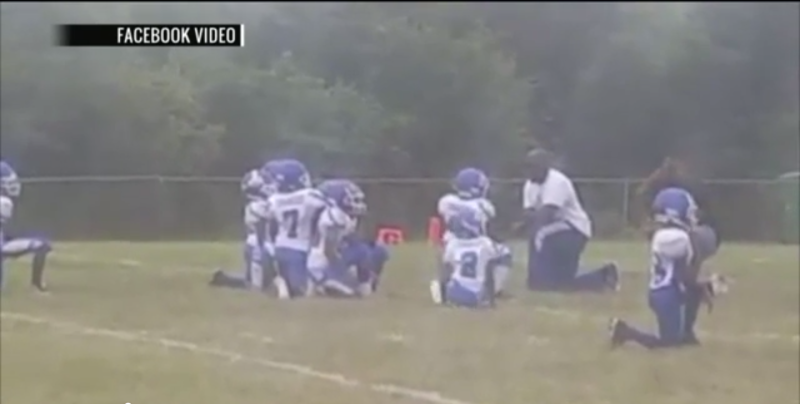 Yesterday, I did what I rarely do and waded into the comments sections of several news posts about the predominantly black Cahokia Youth Football team in Illinois that decided to kneel during the Star Spangled Banner to protest police brutality against black people. The team, composed of eight year old boys, came to this decision after discussing with their coach, Orlando Gooden, the demonstrations this past week in St. Louis following the acquittal of white police officer Jason Stockley, one who killed a 24 year old black man, Anthony Lamar Smith, and planted a gun in Smith’s car after a high-speed chase to justify his murderous acts. As you would expect, the comments from angry white readers ranged from those devoid of logic (“those black kids are learning to be the real racists”) to the typical Anglo-American bigotry (“If they don’t like it they should go back to Africa,” or “I bet they have no daddies to teach them any better,” or “Future Felons”), to the standard keyboard Patriot chatter (“The coach is teaching them to hate America”). The painful truth is that basic facts about American history, government and current events are opined about on a daily basis by people painfully devoid of objective facts. To be clear, the truth of the matter has always been that on average, little black children get robbed of innocence far earlier than their little white counterparts as far as knowing the horrors that loom in society writ large by racists who would just as soon beat or kill them than to say hello. Indeed, from slavery to Jim Crow to today, the “talk” that black parents have about systemic white racism is candid, raw and necessary for basic survival. I was only a little older than these boys, nine years old to be exact, when one of my birthday gifts was an Ebony Magazine pictorial history book that helped educate me further about the black peregrination from slavery to “freedom.” The first entry that my dad rabbit eared for me, however, was from 1955, August to be exact, and the gruesome picture of Emmett Till’s grotesque remains after he was lynched in Mississippi for allegedly whistling at a white woman. Till was 14 at the time of his murder; my father was 15 and my mother, 12, and they both began explaining how the news of Till’s murder was discussed in their respective homes, discussions that reminded them about how the wrong comment, look, or being in the wrong place at the wrong time could leave them dead at the hands of some white person who would probably not even get charged for an offense–let alone convicted in the Deep South. Their lesson made sense to me and has guided me well ever since. The same holds true for the black boys on the Illinois football team. They know that Tamir Rice was 12 when he was shot dead by the police in Cleveland a few years ago. Or how Trayvon Martin was 17 when he was shot by a wanna-be cop while walking to his father’s home in an upscale neighborhood in Sanford, Florida, in 2012. These boys have to be taught these lessons early because ours remains a society in which black skin is feared and black boys and men, especially large black boys and men, are presumed to be menaces and threats. The exception, of course, being large black boys and men who entertain white active and passive racists on the ball field so long as they run, jump, tackle and stay silent about systemic racism. Well, too bad, white racists, survival for these boys and blacks as a whole is far more important than your fragile egos, deliberate indifference to the quality or sanctity of black lives, and reflexive adherence to standing for a National Anthem that has represented the usurpation of black rights far longer than it has the promotion of the same–if ever. To that end, kudos to Coach Gooden and these little Brothers as they gain knowledge of self–knowledge that could save their lives some day.